The first time you spend click to draw 1 card (not through a card ability) each turn, gain 1credit. Aside from Adjusted Chronotype, this is probably the best Genetic resources we've seen so far. In essence, this is a cheaper Professional Contacts that can only fire once per turn (or twice if you also have Gene Conditioning Shoppe): which is great, because the biggest barrier of entry for Pro Con is its high cost. Consider: Pro Con will cost you 5 clicks before you start turning a profit, while Visage will cost you only 2 clicks before you start turning a profit. While it is true that you must spread those two clicks out over two turns, barring click gain shenanigans, it'll also take you at least two turns to click your Pro Con five times! All in all, it's a great card, and one that I'm glad they made neutral because it means that everyone gets to benefit from it. All I can say is that's a pretty good card, especially if it shows early. I put one of in my deck, as I can't free more slot for it, but I wonder if more is really useful. 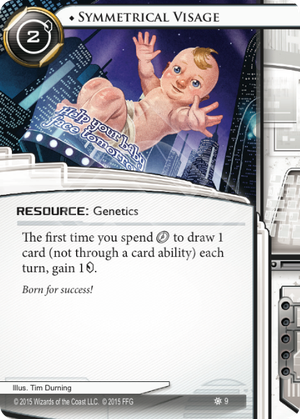 Professional Contacts is a heavy investment, and when you put it in your deck, you generally expect it to be a drawing and economy engine, so you it's better to put 2 or 3 of it to get it early. Symmetrical Visage can be seen more like a little help, cheap to install, so it's not a worry as a 1-of. Not sure if it makes a real good drawing engine, though, even if a compressed click per turn is great. It may be better to put only one along with other non-stackable drawing cards, like Vigil, Earthrise Hotel, maybe Mr Li (not sure for Wyldside, certainly not with ProCon since they don't stack).